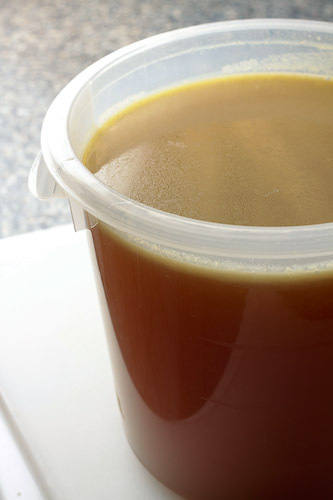 One of the best parts of making your own chicken stock is the layer of fat that settles to the top after it’s chilled. This yellow layer of fat is also known as Shmaltz and to quote Sienfeld, “Its gold, Jerry, Gold!” After the soup has chilled you can skim the fat and save it for later. You can use it for frying up potatoes or better yet, making the best matzo balls you have ever tasted. I am not embarrassed to admit that I made my matzo balls from a Manachevitz mix. However, instead of using vegetable oil as the fat in the matzo balls, I subbed in the chicken fat. I am not 100% sure it made a huge difference, but I do think it added some flavor. 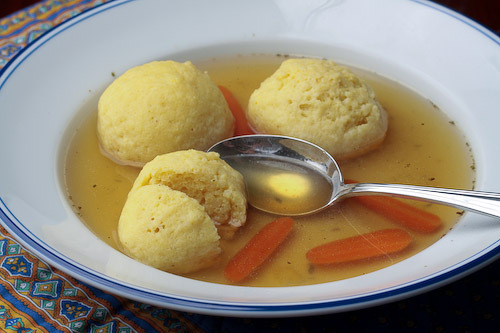 Once the matzo balls were done cooking I simmered them with some carrots in the homemade chicken stock we made earlier. If you are going to use yiddish terms please use correct spelling thank you and i love your web site. Oy Vey! You are right. In my defense, my spelling is bad in both English and Yiddish. I will correct it. Thanks for stopping by!